Terrance Robinson is one of the featured artists that was juried to exhibit in this year’s exhibition at the 25th African American Art Exhibition, Actors Theatre, Louisville, KY. He is a professional artist, entrepreneur and educator that have been exhibited throughout the U.S. He has held many positions in the arts arena as well as higher education. Robinson's works have been collected by both private and public collectors as well as permanent collections. He earned a Masters of Fine Arts and Bachelor of Arts in fine art; thus, his works have evolved into many interesting pathways and opportunities for artistic freedom. 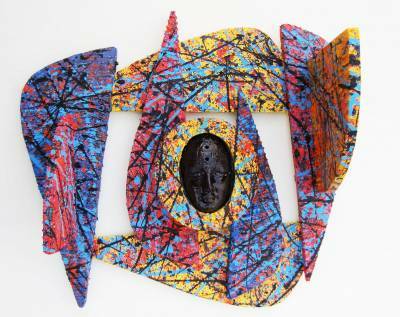 Robinson’s work keeps developing and assisting him in re-inventing himself as an innovative and productive artist. “Ancestors Are Watching: Action Cubism I” was shown at the Beach Institute African American Cultural Center, Charlotte Art League, Fine Art in America (online), and Mississippi Valley State University.